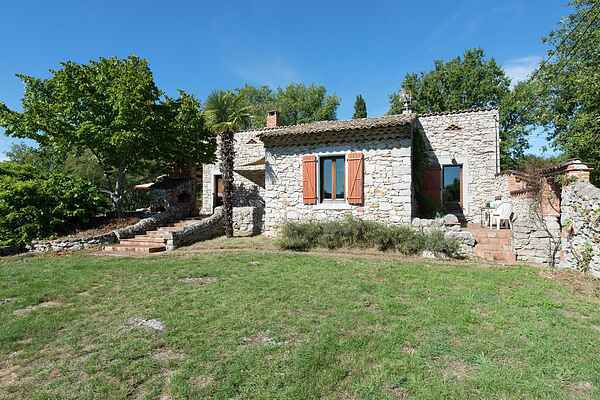 Wonderful vacation home in a great place in the heart of Ardèche. It was built with much love by the owner, intended to become a private home. Today he rents the house out during the holiday months and lives himself elsewhere on the premises (he respects your privacy and there is no visual contact). The house is built in traditional Ardèche style, with stunning views over the valleys of the rivers Ardèche and Chassezac (both about 2 km). Enjoy it from the large terrace with garden furniture and BBQ, surrounded by a, partly a little wild, natural garden of 1000 sqm. Next to the house is a second (covered) terrace, so you can always find a shady spot. A lovely private swimming pool with four lounge chairs complete the picture. You can enter the cozy and attractive interior via the higher south terrace. The atmosphere is determined by the beam ceilings, tiled flooring and tasteful decor. The best beach can be found at the river Beaume, which is a little oasis between bushes and rocks. You can go hiking in the woods to enjoy the diverse natural surroundings, starting 300m from the house, at St. Alban (1.5 km) or at the Bois de Païolive (11 km).